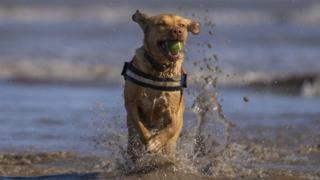 Dogs will no longer be banned from beaches in parts of Merseyside following a "huge" backlash from residents. People were asked to comment on the plan for sections of beaches in Wirral and more than 8,500 people responded. Wirral Council said it was clear the "majority" did not want a ban. Conservative councillor Paul Hayes said many people had been "genuinely upset" by what he described as a "heavy-handed diktat". The ban was proposed amid concerns about excessive dog mess, and would have prohibited dogs from sections of "bathing beaches" from 1 May to 30 September. Dogs are already excluded from some public areas in Wirral, including children's playgrounds. The ban would also have required dog walkers to always carry poo-bags and restricted the number of dogs that can be walked by one person to six. Dogs would also have had to be kept on leads in certain areas. The council said the findings from the consultation would now be analysed and a revised proposal would be put together. Matthew Patrick, cabinet member for the environment, said: "While it's clear we need to undertake detailed analysis of the consultation I think the responses have already shown us that we shouldn't go forward with the beaches." Thousands of dog owners also signed a petition against the plans.